All OnGuard™ aluminum gates feature heavy duty two inch square frames with welded construction for long lasting, trouble free use. 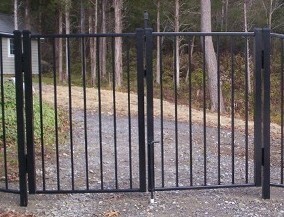 Estate gates offer the additional strength of ‘U’ frame construction for years of smooth operation and proper alignment. All welds are polished before powder coating for a cleaner and more beautiful finish. Available in all styles, colors and sizes this gate offers the same top rail shape as an arched walk gate in a double gate style. This gate comes in all styles, colors and sizes but offers the finely shaped top rail of an elegant European Estate. The arched top walk gate is most commonly used as the main entry gate because the top rail shape projects a welcoming feel. Offered in all styles, colors and widths to six feet. 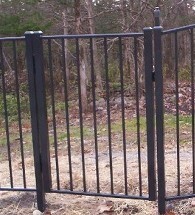 Single leaf flat top walk gates are most common as a service gate. The straight top rail allows the fence an uniterrupted line that appeals to many people. 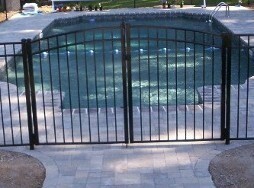 Residential flat top double drive gates are often used on pool enclosures to allow access to larger gardening equipment. 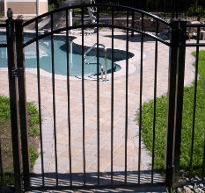 Double gates come in all the OnGuard styles, colors and in widths from six to twelve feet. 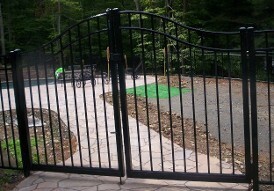 Custom gates can be fabricated to your specifications. 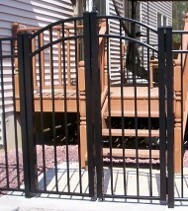 Made to match any OnGuard fence style and in any color or size for any application. Select any of these five colors, but not all accessories are available on every style of OnGuard Aluminum Fence. Individual style pages include accessories for that type of section. Standard flat caps are included with posts.